AVENTURA, Fla. - For more than 15 years, vintage couture and designer deals is what greeted C. Madeleine’s customers. The sign outside of the vintage consignment store proudly designated the store as “one of the fashion wonders of the world." The building is now, closed. When the Leave it to Layron team stopped by, a couple of construction workers were leaving for the day. Large dumpsters in the parking lot were full of debris. The building at 13702 Biscayne Blvd. in North Miami is currently being renovated to make room for a new school. So what happened to C. Madeleine’s? “I gave them hats from the 1920s, and purses from the 1940s," said Annie Reisch. "They're valuable, and I'd like to see if I can get them back." That’s why Reisch contacted the LITL team. She’s genetically tres chic — her mother used to trim hats in a factory; her father worked in the showroom, selling them to department stores. That’s how the couple met. Reisch now considers herself a hoarder of all things haute. Her closet is full of vintage hats, purses, boas, and the like, leaving very little room for her husband’s things. “No, they’re in the other room," she said with a laugh. She told the LITL team she decided to consign a few of her pieces with C. Madeleine’s in 2016. "They looked at it, said the items are great," she said. “I was happy when I left." She said that happiness turned to frustration a few weeks ago. One of her consigned items sold, but after no movement on the other pieces, she decided to get them back. Annie Reisch worried her items placed on consignment were lost. She called the store, but was sent to voicemail that said: "We are moving, right now, and if you need to get in touch with us, please call us, or the quicker way is to email us." "So, I said, fine." Reisch said she sent several emails, and, “I called, and I called, and I called." She called the LITL team after her messages went unanswered and her calls went unreturned. “We’re Moving" was typed on several notes we found taped to the C. Madeleine’s old storefront. One note went on: “After 17 years, C. Madeleine’s is in the process of moving south closer to Midtown. To contact us during this transition, you can either email us at vintage@cmadeleines.com (which is the best alternative) or call and leave a message at (305) 945-7770 (which might take longer to get a response) or check our website for updates www.cmadeleines.com." Another included an apology for “any inconvenience", and ended with, “We look forward to seeing you soon in our new location." The LITL team tried calling the phone number provided, but got forwarded to the voice mailbox. It was full, and could not accept any messages. We kept getting an error message when trying to visit the website — the site was down. Our next stop was by the owner’s home. When we arrived, Richard Kirsch, one of C. Madeleine’s owners answered the door and immediately knew why we were there. He explained C. Madeleine’s landlord had been good to to the business for many years. 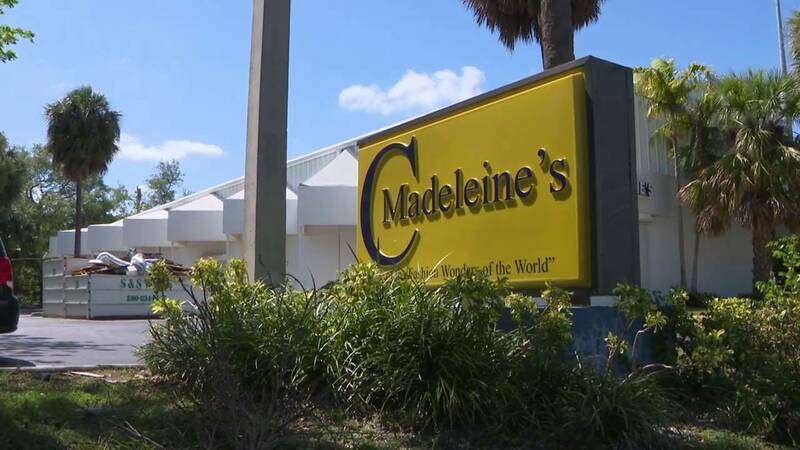 The lease ended, but while he was negotiating for an extension, the school came along and offered a lease rate that was “significantly" higher than what C. Madeleine’s budget allowed. C. Madeleine's consignment shop has been in business for 15 years. He said the school planned to begin renovations, quickly, which meant he had to pack up nearly 100,000 items that were once on display and for sale inside the 10,000-square-foot building. "Unfortunately, we have like 3,000 consignors, and there's no way I can contact everybody," he said. When the LITL team asked about Reisch’s items, Kirsch said she could not get them back, yet. He said it would be difficult to find them because everything was packed and moved into a secure, climate controlled storage facility. Kirsch said finding the right location proved to be more difficult than anticipated. The search was narrowed down to three locations, and he hopes to have a new lease signed and C. Madeleine should be up and running from its new location near Miami’s Design District within the next couple of weeks. We’re told the website is currently being redone and should also be up and running in the coming days. "We have an excellent reputation," he said. "We're going to find a facility."